These are just too great, NOT to copy, right ladies!? I don't have TONS of pictures, but really... these shelves are pretty self explanatory, if you have all the supplies. I got the kind that already had primmer on them, because I was painting mine white anyway. * cut your board to the size you want your shelf. * then cut your door casing at 45 degree angles to fit around the edges. * run a bead of glue along the sides of the board... and attach molding. * use a finishing nail gun to put a few nails in place... holding the molding tight, while it dries. * Once all the glue is dry... fill in ANY holes, or gaps with the wood filler putty. The corbels, we just painted white, as well, and attached them to the underside of the board with screws. And then used the screws that came with the corbels, to attach them to the wall. I wanted to hang our shelves directly over each other to give more of a "Ballard" look... instead of scattering them, like most people do. I think it just looks more... streamline. and I LOVE how it fills up this space in the kitchen! $179.00! (plus shipping)... but instead, bought all my supplies (besides paint, glue, and putty) for only $52.00! I love this!!! Such a great look. I have the ikea floating shelves and I am wanting to change it up bit. I purchased some amazing corbels from ebay. I think I am going to glue some trip on the shelves so they don't look so plain. Thanks for the great idea! They look fantastic! Love your wall color, by the way! 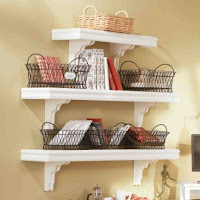 Love love love the shelves!!!!!! Nice job! I love the way you've accessorized them too. Thanks for the tute! ;) Great minds think alike! I post about the SAME thing tonight.. I told you it's a Rachelle/Shelly Smith thing..crazy. They look great. Thanks for the details on how to make them. Dude. You never cease to amaze me. The shelves are fantastic, your Halloween decorations are freaking awesome- I pretty much wanna copy everything, and also- I totally caught Studio 5 the day they showed your family pics. Could your family be any cuter?? Your pictures came out fabulous and you're pretty much like a celebrity around these parts!! Those are so nice! I love how they turned out!! Love those shelves and the cute Halloween decor on them. Way to go. Those turned out just wonderful. Those will be great to change out for different holiday decor. Awesome halloween decor. Love that Potion. I really love these! Definitely on my list of to-do's! Thanks so much for the tutorial. You make it look so easy and fast-which I will soon find out-I'm going to Lowes right now to get the items! I love these shelves. I need to make a few for my craft room for sure! I need to build a few of these shelves for myself! Love them! I need to make some in my dining room. Since I too need a "mantle" to decorate. Especially for stockings at Christmas time! I can't even tell you how much I LOVE THESE SHELVES! I don't have any sort or mantle either, and it has been driving me crazy! I have been thinking, "Where will I hang my little guys stocking!?" You have solved my problem- THANK YOU! Now I just need my husband to have a day off :0) Way to go girl! I did this as my first woodworking project. I purchased a wood trim nail gun off of Craigslist after reading Thrifty Chicks blog for a while. It's taken me months to get up the nerve to finally try my hand at something. I've never used the saw and miter box. I cannot believe how easy this was! I'm so excited. I'm stuck as to how to attach the corbels. There are keyholes in the back of the corbels to hang them on the wall but the tops have a groove that goes down the center. I'm at a loss as to how to attach the corbels to the finished shelf. Can you give me some advice? I would love to finish this project. These are fabulous! But what I really need to know is what color paint that is on the wall. I LOVE it! Oh, I also forgot to include my other question...how did you get those other 3 plates on the wall? I didn't see anything holding the edges. 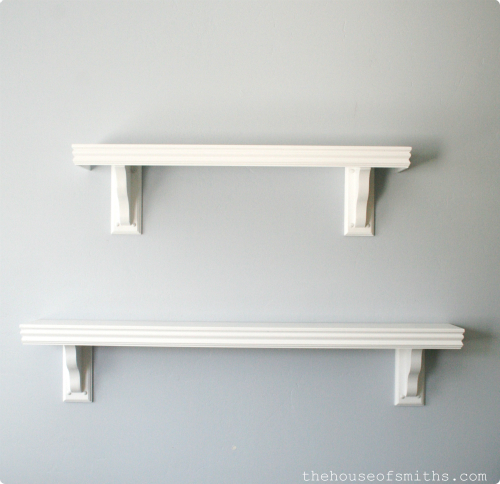 I also love your shelves but can't find corbels for a decent price. Any ideas on where to get them? What are the measurements you used? Length wise? I'm going to try and tackle my first DIY project and hopefully these won't be too hard for me. Never mind. duh! You posted that already. Sorry! I am sooooo excited that I am finally going to make these! What is the width of the door casing? Thanks for all of your darling designs, you inspire me! What is the length of the corbels? I looked at home depot and lowes and what they have seems bigger than what you used. How far out from the wall do the corbels some out from the wall? I looked at home depot and lowes and what they had seems bigger than what you used. I have a corbel question too. I can't seem to find any that look like yours. They are all way to "wimpy" looking. Or they are the super chunk and ornate ones. Where did you get yours?? Where did you get your corbels? I have looked around and only fine wimpy looking ones. Yours look nice and chunky!! Sherry, I have seen them at Home Depot. Can I ask what the width is? You always put a ton of cute stuff on them, so I am going to guess maybe 8"
Thanks for sharing all your amazing stuff! Hi Jamie! It's a 7" wide board.